It was a much anticipated race under the lights of Abu Dhabi without a much anticipated result. The final 55 laps of the 2014 Formula 1 Season decided the winner of the entire year. 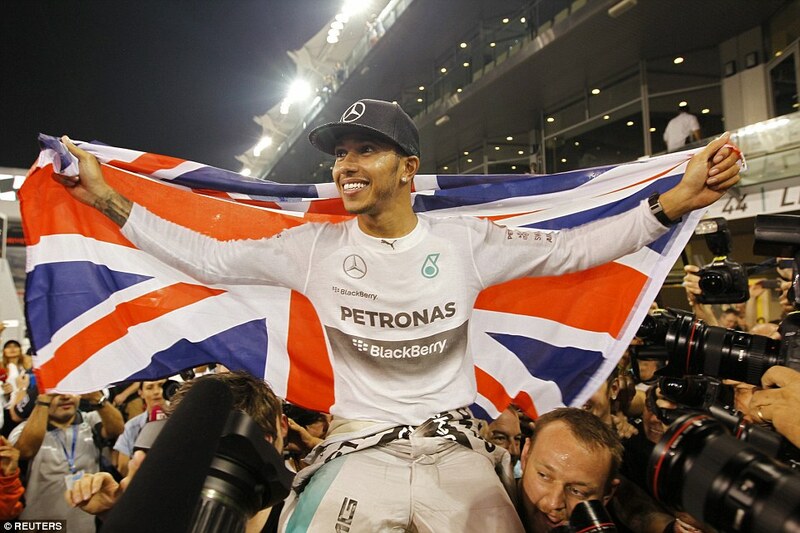 Lewis Hamilton came in as the favorite but just 17 points behind was a german with an incredible will to win. Nico Rosberg, who has been friends with Hamilton since their days back in karting series when they were both around 12 years old took their lifelong rivalry to the biggest stage there is in motorsport. Rosberg who had qualified in first lost his lead before even getting to turn one. After being able to keep his teammate within reaching distance after one pit stop Rosberg faced his worst nightmare. His engine lost a tremendous amount of power and instead of fighting for a championship he had to fight the car to finish the race, which he did ending up in 14th spot. That way Lewis was able to relax for most of the race just working to keep Felippe Massa away from the lead. The brazilian put up a fight but was about 2 seconds shy of going past the now two-time world champion. Lewis Hamilton, who had been serious and barely talking the past week showed quite some emotion in the post-race stage when he had already sealed the deal. Rosberg was obviously not happy with his result but conducted himself appropriately and congratulated his teammate, plus acknowledged the superiority of Hamilton not just that day but throughout the season. Interesting week in the NFL. The first shocker came from the Oakland Raiders who had not won a single game throughout the season but managed to defeat the Kansas City Chiefs 24-20 on Thursday Night Football. On Sunday Seattle and Denver got back to their winning ways and defeated Arizona and Miami respectively. It was also a good day for Aaron Rodgers who led the Green Bay Packers over the Vikings claiming the first spot on the NFC North with a 24-21 win. But the most exciting game once again involved the Dallas Cowboys as they showed up at MetLife Stadium in New York to face the Giants on Sunday Night Football. The Cowboys came off from a bye week where all their division rivals including Giants had lost. Eli Manning had thrown five interceptions on the past game. The game headed in the right direction for the local team who had a 21-10 lead heading into halftime. The Cowboys responded with 21 points on the second half including a game-winning drive of 80 yards with less than two minutes to go in the game. With a 31-28 win the team owned by Jerry Jones is 8-3 this season, about to clinch a playoff ticket. It was a record just like any other that was meant to be broken and Leo Messi had been lingering around it for a long time. Telmo Zarra had of 251 La Liga goals. Messi had tried to break it at the Santiago Bernabeu during the derby but was unluck for that one and the next two matches. Saturday against Sevilla not only did he tie the record, but with a hat-trick he set a new one in 253 and counting. Barcelona ended up winning the game 5-1. Real Madrid defeated Eibar 4-0 to keep the lead of “La Liga” after 12 weeks. In the MLS Playoffs L.A. Galaxy took the lead on the first leg of the Western Conference Final with a 1-0 win and the New England Revolution beat Thierry Henry and the New York Red Bulls 2-1 on the Eastern Conference Final. In Mexico the playoffs are set and America will be facing Pumas, Tigres against Pachuca, Atlas will play against Monterrey and Toluca will have Chiapas as their opponent in the first elimination round. 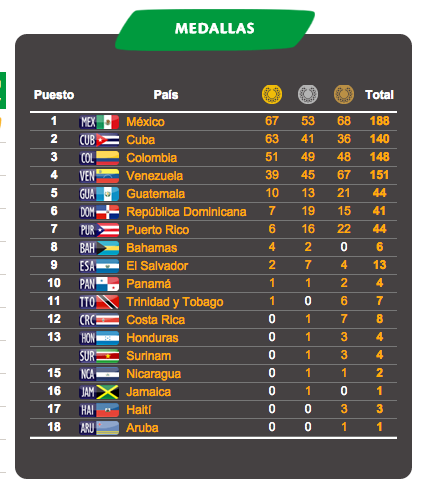 Mexico continues to dominate the medal count in Veracruz with just a week to go in the games but Cuba is closing in strong and with the wide range of track and field events they might find what they need to attack the host nation. Some of the highlights from last week were Horacio Nava’s (MEX) first place in the 20 km. race-walk with a time of 1:25:05 while Mirna Ortiz from Guatemala took gold on the women’s side with a Games record of 1:35:43. In soccer both teams from Mexico (men and women) advanced to semifinals with a perfect streak during the group stage. The men will face Cuba while the women will play Costa Rica. Mexico dominated the synchronized swimming events with seven out of seven wins and that can be considered as to what is making the difference between Cuba’s 63 gold medals and the 67 earned by Mexico so far. Colombia is in third with 51. We are just getting started with a long basketball season and some teams are over the expectations while others are below. Lebron James came back to Cleveland hoping to be the secret element to bring the Cavs back to title contention. Up to this point we can say King James is missing having Dwyane Wade and Chris Bosh by his side since the team he is now playing for is in an early season crisis after a four game losing streak. Toronto is the best team in the league so far with a 9-1 record after ten games. Both Dallas and San Antonio have a 7-3 record heading into the last week of november while the Lakers even with Kobe Bryant being Kobe Bryant can’t find a groove and are 3-7. Last week they were demolished by the Mavericks at Dallas 140-106 just after beating the Rockets on the road.